The Delano Community Farmers' Market was a weekday evening market providing fresh produce to Wichita's urban dwellers. Located just west of downtown, the market was convenient for commuters on their way home. 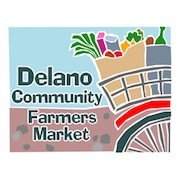 Delano Farmers' Market is CLOSED! The Delano Community Farmers Market lost it's venue in 2014. Since then, a small group has been looking for a suitable place to re-open the market. If you are interested in working on a committee to identify a new venue and get the market back open, please contact market@historicdelano.com. In 2011 the Delano Community Farmers Market won 1st Place as Kansas' Favorite Farmers Market among Boutique Markets (those with 15 or fewer vendors) and 19th Nationwide! Thanks to everyone who voted for us as their favorite farmers market! In 2012 we came in 5th in Kansas.